THE BEACH waikiki boutique hostel by IH i Honolulu, USA: Bestill nå! We are a fully renovated hostel and offer quality facilities to our guests. We have air conditioners in all the rooms, private bathrooms, microwaves, refrigerators, shared kitchen and more. Discounted shuttle/tours are available throughout the week. We also offer FREE continental breakfast, and Wifi/Internet. Come and join us for FREE Pizza nights at the rooftop lounge! Bicycle, surf board, and snorkeling equipment rental available. Parking is $12 per night per car. Airport drop off is available starting at $15 per person. We are conveniently located right in the heart of Waikiki, 1/2 block away from Waikiki Beach, very close to many shops, restaurants, surf spots, parks etc, and just a short drive to the most beautiful beaches, waterfalls, hiking trails, and attractions! Come enjoy all that Waikiki and the island of Oahu has to offer, and tell your friends too! Rate does not include tax. -Check in time is from 2:00 pm and our front desk opens 24 hours! We accept cancellations/changes only via e-mail. Please note that any cancellations/changes must be made at least 72 hours prior to your scheduled arrival time indicated upon booking. In case the arrival time was not indicated upon booking, any cancellations/changes must be made at least 72 hours prior to your scheduled arrival date. We charge the total of the first night for all cancellations made less than 72 hours and no shows. In case of no show, we will charge in full for the first night and cancel the reservations for the second night and thereafter. Had a great stay! The staff are so helpful and friendly, and the hostel are located just a couple of minutes from Waikiki and the shopping street. The trips they offer daily are great and you are guided around the Island in an adventurous and fun way! I really recommend this place, if you want a social, fun and easygoing housing in Oahu! Location (if you want to stay in Waikiki) is perfect, staff was super friendly, lots of tours and activities (we did not go on any tours as the day we had planned to do so, it was fully booked. So plan ahead!). The most negative was the poor air quality in our room. We had a private room, with shared bath. The aircon was dusty and smelled like mould, other than that the room was ok and the total experiece was good! The hostel is located only 2 minutes from the beach and not far from shopping. (Keep in mind the big Food Pastry(?) is a 10 minute walk) It has a nice rooftop We chose Private room with shared bathroom, but were suprised by having our room inside a "dorm" with shared kitchen. Wasn't really a big problem but I wish it was called "semi-private" or something so we would know before booking. Yes, kitchen is close- but there is only 2 plates and one frying pan! And the room is made for 7+ people. We stayed in a six bed dorm here for two weeks, and were mostly happy with our stay. Security is not impressive as the back gate often is left open and windows can be opened from the outside. Bathrooms were not cleaned every day, but otherwise cleanliness was good. Staff were friendly and I fell in love with the parrot who was around at times. Usually quiet at night, as the common area closes at 10pm. 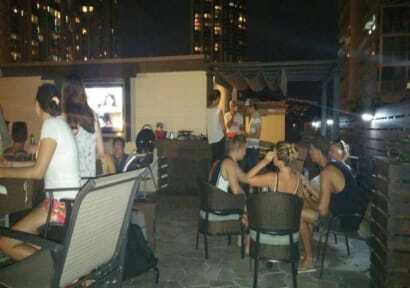 Rooftop terrace was lovely and spacious and kitchen area quite well equipped.